It’s been a very mixed bag of weather in the last few days: one day of howling SE gales and prolonged heavy rain; one calm day with rain and fog; one calm, mild and pleasant day; one day of freshening SW winds and occasional showers and then finally, a calm day with a fairly bright start but heavy rain in the afternoon. The south-easterlies had largely blown their course and brought us very little new, although the calmer conditions following the storm saw the year’s first Great Grey Shrike found on Dronger on 5th, with the autumn’s first Moorhen and Long-eared Owl also discovered around the island, a Richard’s Pipit (at Bull’s Park), a Redstart and increased counts of Robin (31) and Song Thrush (72). 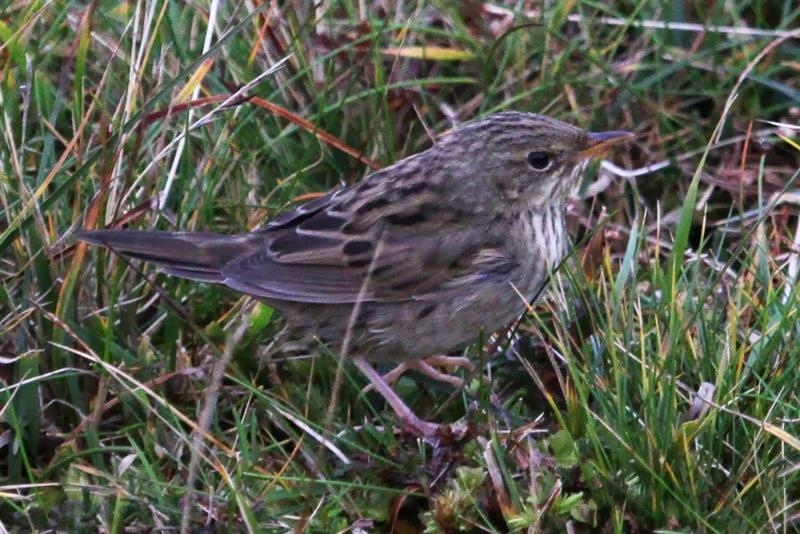 It never came particularly close, but the scope views of Fair Isle's 381st species were good. It spent most of its time halfway up the cliff face, although it could go missing for long periods (including for about 40 minutes after I initially saw it from the cliff top, when brief views and distance meant it just looked like a slightly odd phyllosc - thankfully Susannah said she'd keep me a Sunday lunch, so I was able to wait for it to reappear without misisng my roast dinner!). Passing up on this beauty would have been a real vireo nasty. 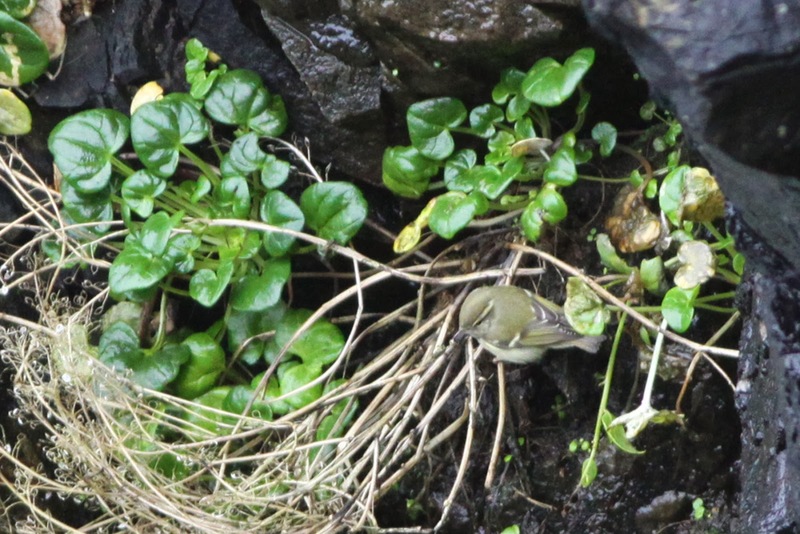 ﻿All the birders on the island were able to enjoy views of this American vagrant, which follows hot on the heels of Shetland’s first record on Unst last year and, in true Fair Isle fashion, Graham discovered a Lanceolated Warbler in the Wirvie Burn on his way back from the Vireo twitch! This Lanceolated Warbler could be very showy (although also spent some time hiding in tussocks of grass along the Wirvie Burn). Lancies have also been found on the day of the Upland Sandpiper this year and Magnolia Warbler in 2012, providing the classic 'east meets west' cliche! Photo by David Parkin. 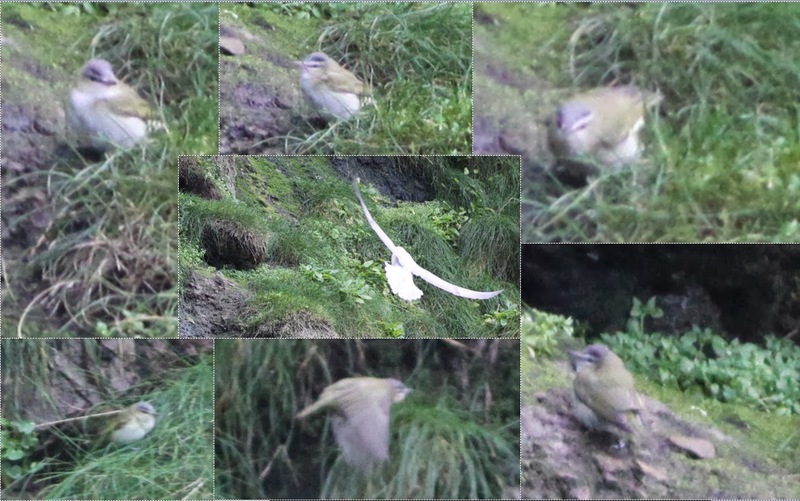 The 7th was a lot quieter, with a Barred Warbler in the Gully the only real new bird of note. 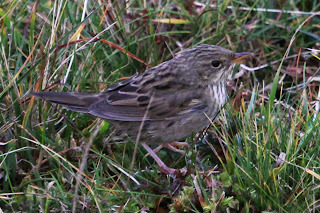 Other migrants in recent days included a Grasshopper Warbler and Reed Warbler (both discovered on 4th and a useful reminder that we get common migrants on Fair Isle as well! ), 2 Ring Ouzel (4th), Mistle Thrush (6th), 6 Crossbill (4th) and a scattering of common migrants, Goldcrests, thrushes, redpolls (with both Lesser and Common recorded), Water Rail (6th), up to 2 Short-eared Owls, up to 5 Jack Snipe and up to 16 Reed Bunting. Lingering birds included the Dotterel at Barkland (to 7th), Hen Harrier, Stonechat, up to 37 Snow and 5 Lapland Buntings, 2 Great Spotted Woodpecker, whilst Yellow-browed Warbler numbers declined to 4 on 4th but increased to 6 on 5th and 10 on 6th as an apparent small, fresh wave of arrivals appeared. A Yellow-browed Warbler on the cliffs of Dronger. As is typical for this time of year, there has been some wildfowl passage (with more likely in the north-west winds forecast during the forthcoming week). Small numbers of Pink-footed Geese on the move peaked at 132 on 6th, whilst Greylags moved in larger numbers on 7th (when 342 were counted), 15 Barnacle Goose were seen on 3rd, the first 7 Whooper Swans bugled over on 6th and there were up to 60 Wigeon, and single Tufted Duck and Scaup. The Wigeon flock has spent most of its time on Meoness. 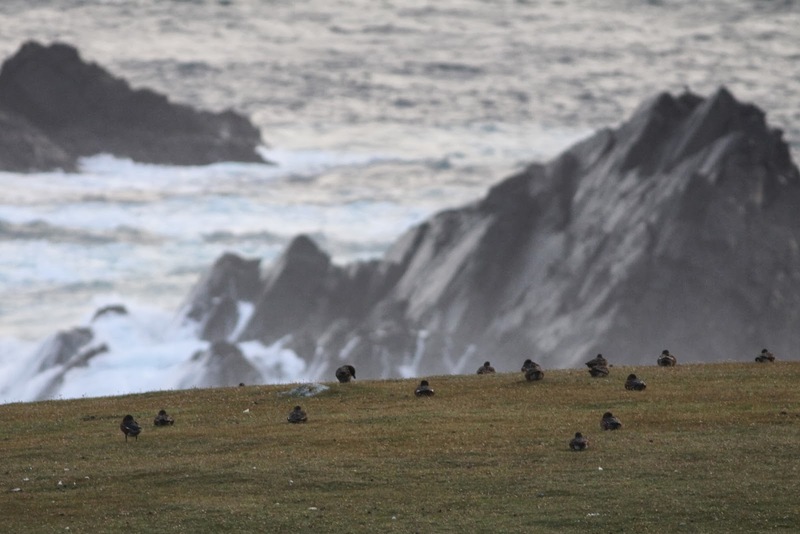 The Good Shepherd is now on its winter timetable (and we’ve seen the last of the Saturday flights) as the autumn grinds inexorably on, although the sailing on 5th delivered Sooty Shearwater, Storm Petrel and 2 blue Fulmars. There’s only 3 weeks left of the season and, whilst things might be slow in the next couple of westerly-based wind days (although redpolls, Lapland Buntings, geese, swans and maybe even another American bird could be on the cards), an easterly airflow forecast from the weekend looks distinctly more promising. We’re fully booked until the 17th October, but still have a few rooms left at our reduced rate after that if you want to take a punt on ‘Rubythroat Wednesday’ (ok, it would sound better if it was Rubythroat Tuesday, but that’s just the way the calendar crumbles), the 23rd October (when 2 Rubythroats and a Rufous-tailed Robin have been found on Fair Isle in the last decade). Finally, FIBO has been asked to pass on thanks to the birders who used the Stackhoull charity tea stand and raised £56 through last week for the Goodwill Foundation. Many thanks for Robert and Fiona as well for providing us with shelter down the island and a welcome brew.